Saturday Oct 5th found us up and doing at 6am. 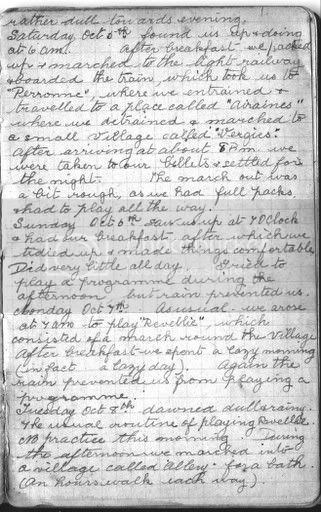 After breakfast we packed up & marched to the light railway & boarded the train, which took us to Perronne, where we entrained & travelled to a place called Airaines where we detrained & marched to a small village called Vergies. After arriving at about 8pm we were taken to our billets & settled in for the night. The march out was a bit rough, as we had full packs & had to play all the way. Thursday Oct 5th bright and sunny from the start.